Right now the West St. Paul city council is debating the 2018 budget and a potential 10-12% levy increase. Yes, taxes are going to go up. This really isn’t a surprise, especially since the city has been unable to secure state help in paying for the recent Robert Street reconstruction (I explored taxes vs. investment last year). These are preliminary numbers and the city council and mayor are working to bring those numbers down—nobody wants a huge tax increase. They will wrangle over ways to slash the budget, including closing the city pool and Thompson Golf Course, delaying improvements to Marthaler Park and more. Budget cuts are painful, no way around it. Wouldn’t it be nice if there were a way to invest in West St. Paul without adding to the budget? Oh yeah, there is: The Robert Street Tunnel. The River-to-River Greenway is a Dakota County trail project that would link West St. Paul attractions and connect us to regional trails. 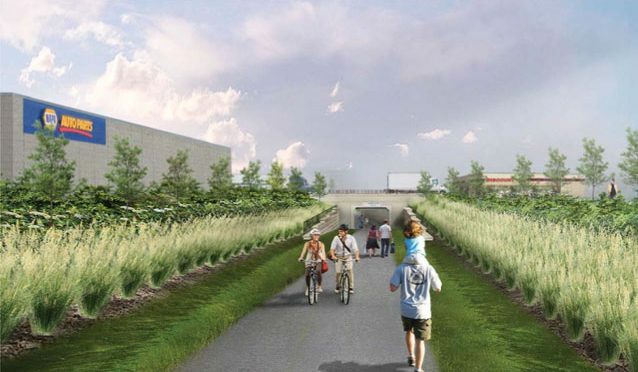 A proposed tunnel under Robert Street would create a much safer crossing (as opposed to crossing six lanes of traffic at the already-busy Wentworth intersection) and make the trail a serious attraction. The best part? The tunnel is already paid for. That’s right: The tunnel would likely add $0 to the West St. Paul budget. I’ve gone over the numbers before, but the tunnel is projected to cost between $2-3.2 million, and a combination of federal, state and county funding comes to a total of $3.05 million (the state upped their $2 million to $2.2 million at the end of the last session), plus 75% of acquisition costs. Plus Dakota County says they’ll pay for any overages—they don’t expect West St. Paul to pay anything. So we can take a major step forward in securing our own regional trail—right through the heart of West St. Paul—providing a major amenity to residents and potentially bringing more people to West St. Paul, without raising city property taxes. That should be a major win: Big investment in West St. Paul with no drag on the budget. Everybody wins! Amenities for biking and walking and no tax increase to pay for it. The city council just has to say yes. But so far a majority of the council has said no. They cite the need for business development, even though nothing has come together and the lot we’re talking about is currently empty. If you’d like to see investment in West St. Paul without adding to our budget, you need to tell the city council. You can call or email them directly. You can also sign a petition supporting the River-to-River Greenway.